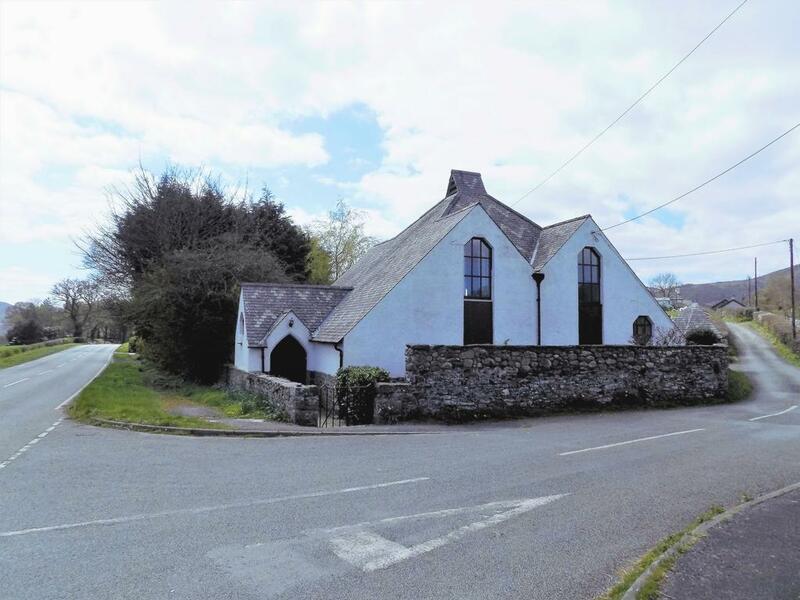 nu:move are delighted to offer an exciting opportunity to acquire The Hall, a prominent detached residence occupying a large plot, located in the traditional pretty village of Tyn-y-Groes, situated within the picturesque surroundings of Conwy Valley, North Wales. The Hall, is a rare and unique property which is an exceptional example of distinguished Welsh architectural history, designed and built by the iconic and well revered local architect of Llanfairfechan, Herbert Luck-North c1904 after he returned to North Wales after forming a consortium of architects in London. Steeped in Local History, and originally designed and constructed as a Church Hall by Herbert Luck North for an additional part of a proposed, but not executed scheme for the new church at Caerhun. The property is a beautiful Grade II listed building inspired and designed to reflect the strong Arts and Craft influences that presented significant historical and architectural interest within the period in its offering of geometric conception and powerful Gothic influences, this is particularly apparent in the beautiful designed Chevron tiled patterning of the roof tiles. This extraordinary building is essentially of double panel design with central unified patent middle roof and surrounding Gable. The intriguing double gabled roof sweeps up to an equally captivating gabled bell turret rooftop feature. Offering outstanding, classical period features including solid stone fireplace, open beamed vaulted high ceilings, slate tiled floor, arched door-ways, accompanied with many new but sympathetic additions to the property in the form of installed under-floor heating and galleried mezzanine landing. The property also benefits from a large, mature south facing garden incorporating mature trees, lawned areas, fully paved patio areas and various outbuilding/storage areas, 2 detached Garages and a large garden shed and a greenhouse. Special attention must be drawn to the original triangular Pavilion /store with corresponding Chevron roof patterned tiled decoration within the garden. Off road private parking for 2 cars. This substantial, spacious property has been sympathetically improved by the long term owners of the property, to include underfloor heating, newly laid porcelain floor tiling to the ground floor, recently installed oil tank. As a very rare and therefore welcome addition to the property market, The Hall provides a unique opportunity for the right buyer to add their own stamp to this beautiful building as the rewards will be high for those with a vision to further enhance this unusual, individual and charming property, while acquiring their very own piece of history designed by a very important early 20th century regional architect. The property is situated within the beautiful natural area of Tyn-y-Groes, surrounded by the beautiful scenery of the Conwy Valley and Snowdonia National Park, beautiful rear views of Snowdonia National Park and Mountains which is ideal for walkers and nature wildlife lovers, nature trails and cycle paths are popular within this scenic area. Within easy reach by car, is the traditional Victorian town of Llandudno, home of the Great Orme, The Victorian Pier, Blue Flag Beaches and beautiful Promenade, Leisure Center, Shopping areas, Bars, Restaurants and also not too far from the historic and unique medieval walled town of Conwy, with its historic narrow streets, fisherman's harbor, quaint buildings, and the extraordinary Conwy Castle.